The main goal of this study is to assess and compare three advanced machine learning techniques, namely, kernel logistic regression (KLR), naïve Bayes (NB), and radial basis function network (RBFNetwork) models for landslide susceptibility modeling in Long County, China. First, a total of 171 landslide locations were identified within the study area using historical reports, aerial photographs, and extensive field surveys. All the landslides were randomly separated into two parts with a ratio of 70/30 for training and validation purposes. Second, 12 landslide conditioning factors were prepared for landslide susceptibility modeling, including slope aspect, slope angle, plan curvature, profile curvature, elevation, distance to faults, distance to rivers, distance to roads, lithology, NDVI (normalized difference vegetation index), land use, and rainfall. Third, the correlations between the conditioning factors and the occurrence of landslides were analyzed using normalized frequency ratios. 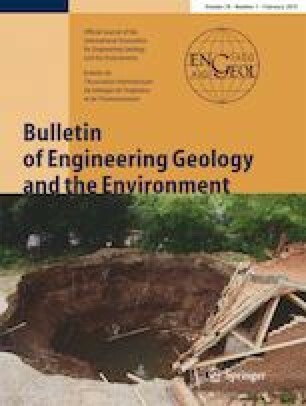 A multicollinearity analysis of the landslide conditioning factors was carried out using tolerances and variance inflation factor (VIF) methods. Feature selection was performed using the chi-squared statistic with a 10-fold cross-validation technique to assess the predictive capabilities of the landslide conditioning factors. Then, the landslide conditioning factors with null predictive ability were excluded in order to optimize the landslide models. Finally, the trained KLR, NB, and RBFNetwork models were used to construct landslide susceptibility maps. The receiver operating characteristics (ROC) curve, the area under the curve (AUC), and several statistical measures, such as accuracy (ACC), F-measure, mean absolute error (MAE), and root mean squared error (RMSE), were used for the assessment, validation, and comparison of the resulting models in order to choose the best model in this study. The validation results show that all three models exhibit reasonably good performance, and the KLR model exhibits the most stable and best performance. The KLR model, which has a success rate of 0.847 and a prediction rate of 0.749, is a promising technique for landslide susceptibility mapping. Given the outcomes of the study, all three models could be used efficiently for landslide susceptibility analysis. •KLR, NB, and RBFNetwork models were compared in this study. •The Chi-squared statistic was used to select conditioning factors. •The ROC curve, ACC, MAE, and RMSE methods were used to assess the models’ performances. •KLR showed the most promising results. The authors would like to express their gratitude to the Editor-in-Chief Martin Gordon Culshaw and two anonymous reviewers for their helpful comments on the manuscript. This research was supported by Project funded by China Postdoctoral Science Foundation (Grant No. 2017 M613168), Project funded by Shaanxi Province Postdoctoral Science Foundation (Grant No. 2017BSHYDZZ07), Scientific Research Program Funded by Shaanxi Provincial Education Department (Program No. 17JK0511), the Open Fund of Shandong Provincial Key Laboratory of Depositional Mineralization & Sedimentary Minerals (Grant No. DMSM2017029), and the Open-ended Fund of the Key Laboratory for Geo-hazard in Loess Areas, Ministry of Land and Resources of China (Grant No. KLGLAMLR201603).